Brides don't have all the fun. Men's Vogue reports that Barker Black creative director Derrick Miller decked himself in bespoke duds and velvet slippers with self-designed stag head embroidery for his big day of knot tying with interior designer Jennifer Vaughn. 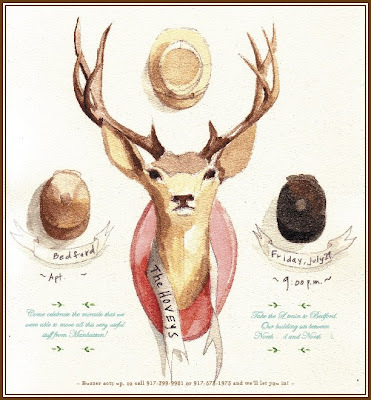 The couple also had the forethought to carry the stag theme further -- into their official sealing wax seal and the guestbook, which featured a stag head watercolor by the great Swede Mats Gustafson. That painting reminded me of one of my own from a few years back, designed to announce the celebration of our big move to Brooklyn. holl, u make the best invitations!